After months of looking forward to another BCC (“Bull City Classic”, for the uninitiated), we were treated to a memorable start to the 2016 season. Before all attention turns to taming the Deacs in Week 2, in no particular order, here are the Top 10 observations from the battle with the Eagles of NC Central. 1) Coach Cut looks better in blue than beige(?). This is from my wife after seeing Cut on Blue Devil Walk in fancy new threads. Personally, I prefer him in cap and headset on the sidelines. 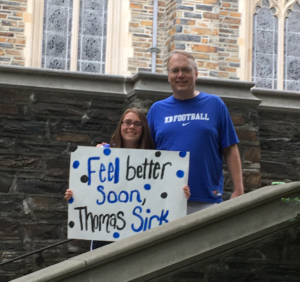 2) Thomas Sirk is a warrior – he will be missed. After leading us to the first bowl win in over 40 years, it’s just wrong that the injury bug has bitten Sirk again. ARGH! There is no doubt he’ll do whatever he can to contribute to leading the team to a 2nd consecutive bowl win. Truly, alll the best, Thomas! 3) CAPTAIN Thomas Hennessy finally gets some lovin’ from Cut. Because of team captain Thomas Sirk’s inability to walk to midfield for the flip, Cut’s going to rotate a 4th captain in each week. He appropriately selected Henny for Week 1. I’m convinced he will set the mark for longest NFL career from the Cutcliffe era. 4) Chris Taylor (#82) will have an impactful 2016. First tackle of the year, tough reception, AND a hustle fumble recovery on a kickoff (NC Central didn’t seem to realize that the ball is live even if you don’t touch it on kickoffs). He’s visibly bigger and stronger – expect him to have a great season. 5) Daniel Jones and Parker Boehme can both play. Football is the ultimate team sport, but it’s a whole lot tougher to win if the guy that touches the ball each time on offense can’t carry his own weight. Jones dropping the deep ball over TJ Rahming’s shoulder and Parker’s crazy run through the Eagle secondary (think bowling pins) reminded all Devil fans that we’ll be fine at QB. 6) Say it isn’t so – Bob Harris’ last year?! The Voice of the Blue Devils was recognized on the field as this was the last opener he’d be broadcasting. I honestly can’t imagine the number of people he’s touched over they years – a true gentleman that will be sorely be missed. I assume Dave Harding will be assuming the lead role next year. 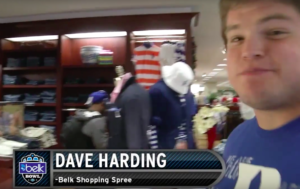 He’s come MILES since we first saw him picking out jeans at the Belk Bowl, hoping they might help him get a girlfriend. 7) All students MUST evacuate at halftime. The student section has moved to the end zone, which for the 1st half, worked great. It packed the students in tightly with the band and you could really hear them. However, accordingly to a well-placed Duke Administrator, there is a rule that ALL students must leave at halftime, study for a few hours, and then report to Shooters, a local bar, by 11:30. While it’s likely the action at Shooters late Saturday was more compelling than the 2nd half of the game, I don’t think that’s a safe bet for the rest of the season. There should be plenty of excitement against conference rivals like UNC, so I challenge some students to go ‘rogue’ and actually stay for the entire game. Homework (and alcohol) can wait. 8) If you travel to Vietnam, you get to play Tight End. 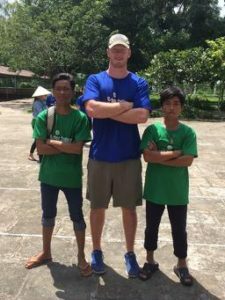 Bronson Bruneau, back-up long-snapper, represented Duke on a service project to Vietnam in the off-season. In return, he got to sniff the field a bit (good luck beating out Hennessy); he took some snaps at TE! Continuing the theme… despite the graduation of DJ Reeves, the Tight End position group looks to still be the strongest of the entire team. Schneider and Helm are beasts, for sure; but Saturday night, Dan Beilinson and Davis Koppenhaver showed they can play as well. Heck, Davis even got a TD! Huge milestone for a kid who’s had to overcome some medical challenges along the way. 10) Asheville isn’t fully invested in #DukeGang. 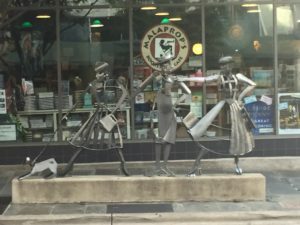 We decided to stopover in Asheville on the way home, being a long weekend, and Adrianne’s favorite author being in town (Louise Penny). While exploring the town on Monday morning, I had a guy come up to me and ask me if I was the Duke football coach (I had a Duke T-shirt on). Later that morning, at a coffee shop, a guy saw my shirt and said… “Duke football. They’re never good. And Coach K needs to smile more.” I assured him that Duke football WAS good and that he needed to start following Coach Cut, who has plenty to smile about and does often. 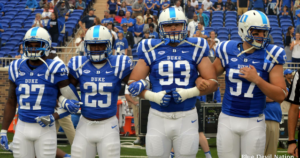 This entry was posted in Duke Football, Uncategorized by pmiller55. Bookmark the permalink.